It's amazing how fast the holidays can catch up to you. Before you know it, your kids will be on winter break looking for something to do. If you're in need of some cheap, super crafty ideas that you can do together, check out our 5 Homemade Christmas Ornaments for Kids Easy Christmas Ornament Crafts collection. These homemade Christmas ornaments are not only great new Christmas ornament ideas for you to try, but they're also easy Christmas crafts for kids that they'll love working on with you. You can get started on any of these projects today because you can download the full instructions with new eBook, 7 Easy Homemade Christmas Ornaments for Kids, which is filled with Christmas ornament crafts for kids of all ages. You won't have to worry about running out of projects to do by Christmas because these handmade Christmas ornaments will be so fun, they'll want to make a whole set. Bottle Cap Snowman Ornament - Crafting with the kids doesn't automatically mean you need to run out to the craft store and spend money on supplies. You may already have everything at home needed to make a recycling craft or a green craft like these craft snowmen. These homemade Christmas ornaments can also be hung around doorknobs or anywhere else around your Christmas home decor to add a little extra brightness. 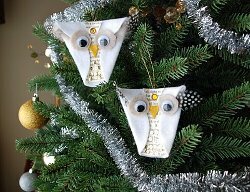 Snowy Owl Ornaments - Felt is a versatile craft material that children of all ages will find easy to work with, making these adorable animal crafts a must-try. Each owl can be as individual as your children with their choice of embellishments and accessories. Easy Christmas kids crafts like these are a lot of fun for all ages, and all they need to be put together is glue. Wax Dipped Pine Cone Ornaments - Nature crafts are a great way to bring freshness back into your home during winter, and nothing will get the kids more excited to make these homemade Christmas ornaments than getting to round up a bunch of pine cones outside. Crafters of all ages will be really impressed with the techniques involved in this Christmas ornament craft, making it twice as enjoyable for everyone. Salt Dough Gifts Tags and Ornaments - Not all of the homemade Christmas ornaments you make with your kids need to be big. 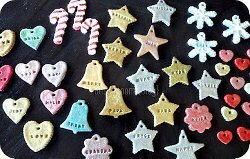 You can whip up a whole batch of salt dough ornaments and tags that you can all personalize in a matter of minutes. Kids can work on this easy Christmas kids craft for hours and will be able to show off their achievements not only on the Christmas tree, but also on some special gifts too. 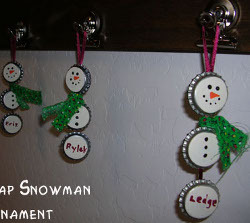 Button Photo Ornaments - These special homemade Christmas ornaments may be more for you than for your kids. You can commemorate your day of crafting with this easy felt craft that kids will love to decorate. Now you can have a keepsake with a sweet little picture inside to hang on your Christmas tree every year. Don't get caught without crafts this winter break! Download a free copy of 7 Easy Homemade Christmas Ornaments for Kids and get ready to have some family fun this holiday season!